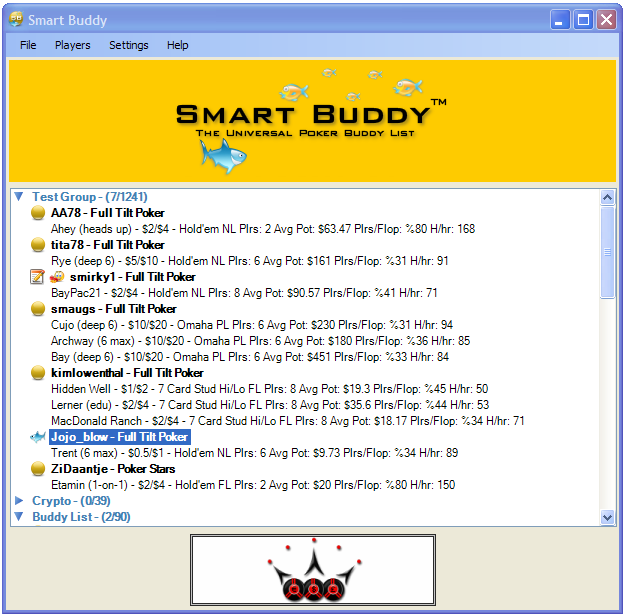 Smart Buddy is an automated buddy list that works across all of the major online poker rooms. Users can enter in the screen names of their favorite pros, friends, fish, and sharks and be alerted as to when they log on. The program works similarly to AOL Instant Messenger in format and if you double-click on a table in the list, the program will open up the poker room and take you directly to it. Oftentimes, hunting down your favorite poker pros and friends online can be very problematic. Most poker rooms have a search feature rather than a poker buddy list. However, in Smart Buddy from Poker Pro Labs, players can enter in all of the players they wish to find online and have them appear in one list. Thanks to Smart Buddy, you no longer have to load up multiple online poker clients and perform manual searches. Installation is very simple and is done by double-clicking the executable file obtained from the website. There is a free trial for users interested in giving it a test drive; otherwise, the license information is entered in at the login screen. From there, the buddy list opens up with default pros at a few online poker rooms. The program now has a Find search field if your list is so long that it becomes hard to hunt down someone. In addition, it can import lists from a text file or directly from PokerTracker. Users can also set preferences to turn on or off alerts when players log in or out. Please note that Smart Buddy only works for players sitting at cash ring games and on PokerStars only for sit and gos. This program does not work for scheduled tournaments. 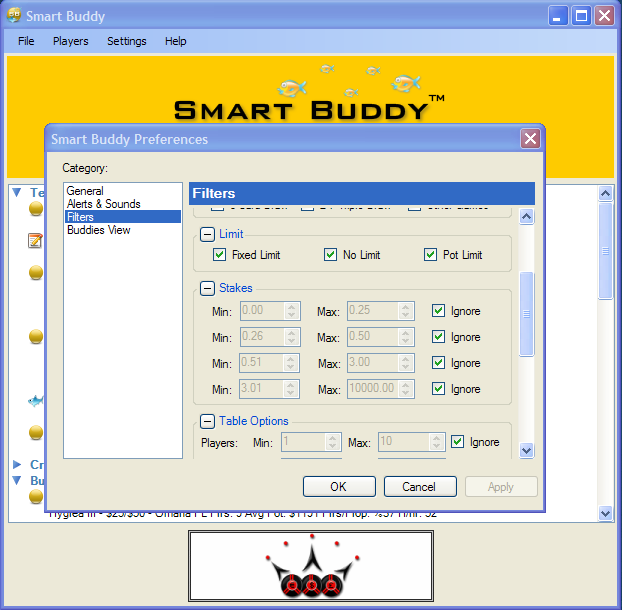 Smart Buddy is a very simple and straightforward program to use that can be up and running in a matter of minutes. It's a very convenient way of seeing who is online in order to avoid the sharks, sit down with your favorite fish, or watch one of your friends play. The idea is perfecdt - The way the software works is brilliant. The msn like function where is signals when fish come online and the double tab to open tabel is perfect. Comes preloaded with the screen names of all the pros.